We felt ready to take a proper break and were keen this year to create new memories that enabled us to relax and the children to enjoy themselves. We couldn’t face going to our usual spots, so we looked for somewhere new. A blogger friend made a comment that it’s perhaps not a good idea to completely avoid those places that we used to visit, after all, good memories were made there, which Abi’s siblings will want to remember too. A few people suggested the New Forest, and as we enjoyed our holidays in Finlake, Devon, in previous years, I thought this could be the ideal choice. Normally, finding suitable accommodation takes ages and is really hard to get somewhere that ticks all our boxes, but I typed a basic search online and the Upper Kingston Farm Cottages popped up immediately. It was perfect. I couldn’t believe that it was both available and within our budget. Within half an hour, I’d booked our holiday, a first! I do believe God was looking after us. I felt both Abi’s absence and presence on holiday. At times, this comforted me, but there was mostly the despairing, sickening, guilt-ridden feeling of not having her with us. One day, we went to Hurst Castle, a fort and lighthouse off Milford-on-Sea. 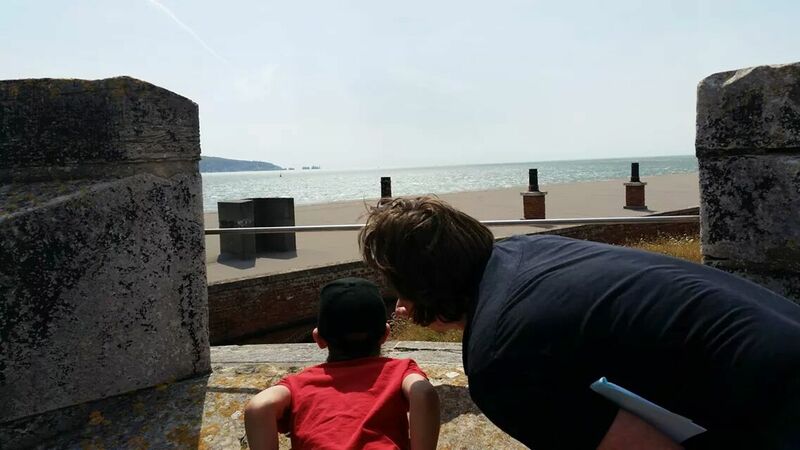 From the castle turrets, we had stunning views across the Solent of the Isle of Wight, and significantly, the Needles, the place where we last were on holiday with Abi, the memories as fresh as yesterday. I felt sobs rise up, but quashed them. I was comforted when I realised we’d still managed to connect this new holiday with our last one. It was completely unintentional (on my part anyway), but it felt so very important. And of course, we were touched by ‘fairies‘ there too. This entry was posted in Life with grief, Remembering Abigail, Special days and occasions and tagged child bereavement, grief, holiday, parenting by Chasing Dragonflies. Bookmark the permalink.